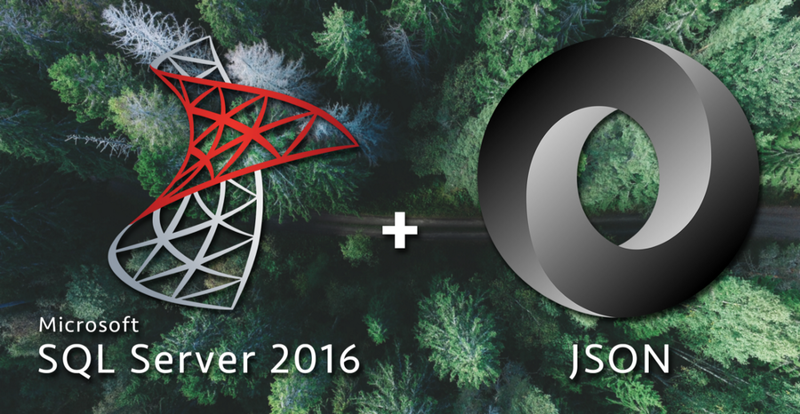 This is the second article in my series about learning how to use SQL Server 2016’s new JSON functions. If you haven’t already, you can read Part 1 — Parsing JSON. Last time we looked at SQL 2016’s new functions for parsing JSON data. Today, I want to explore the different options available for creating JSON data from a SQL result set. The data above should look pretty familiar from Part 1 of this series. It’s only two rows and a handful of columns, but it should get the job done at showing how to use SQL’s two new JSON creating functions. First up is the clause FOR JSON AUTO. This clause will take the results of a query and format them into very basic JSON. Not much magic here, but it sure beats having to hardcode (or build dynamic JSON strings) using the first method outlined above. FOR JSON AUTO does offer some formatting flexibility though as shown in the examples: nesting JSON objects is possible through joining of tables. Although FOR JSON AUTO is perfect for quick and dirty JSON string creation, SQL offers much more customization with FOR JSON PATH. TheFOR JSON PATH clause will take column aliases into consideration when building the JSON structure, making it unnecessary to have to join data in order to get a nested JSON schema. And that’s it for creating JSON data in SQL Server 2016. Stay tuned over the next few weeks as we look at other SQL JSON functions that will help us modify data as well as a comparison of how SQL’s JSON functions perform against other languages JSON serialization/deserialization methods. As a developer my favorite new feature of SQL Server 2016 is JSON support. I had this same type of excitement for XML in SQL Server, but after using it the excitement quickly turned into disappointment: having to constantly use the XML datatype was inconvenient (when most XML data I used was already stored in nvarchar(max) columns) and I never found the syntax of OPENXML() to be that intuitive. For any of the SQL JSON functions (OPENJSON(), JSON_VALUE(), JSON_QUERY(), andJSON_MODIFY()) you can specify whether invalid JSON paths will return NULL or an error. The default value is lax, which will return a NULL for non-existing JSON paths, whereas strict will return an error message. The lax modifier is helpful when writing queries that check to see if values exist in a JSON object while the strict modifier works great for error checking and and validation. A simple function for verifying whether an inputted string is valid JSON. This is great to use in order to validate JSON formatting before running any of remaining functions in this post. Extracts a scalar value from a JSON string. This function needs to be able to parse the value, so it will not parse out complex objects like arrays. JSON_VALUE() is great for accessing operational data that might be using JSON to store multiple attributes for a single entry. JSON_QUERY() is meant to work for all of the datatypes that JSON_VALUE() doesn’t know how to return: basically JSON_QUERY() returns JSON string representations of complex JSON objects like arrays. It’s possible to use JSON_QUERY() along with JSON_VALUE() to essentially extract any type of data from JSON, whether it’s a simple or complex object datatype. While JSON_VALUE() extracts singular scalar values and JSON_QUERY() extracts singular JSON strings, the OPENJSON() function extracts result sets from a JSON string. In addition to the extracted value, OPENJSON() outputs the order of JSON objects as well as their datatypes. OPENJSON() will also output string representations of JSON arrays instead of just displaying NULL, similar to JSON_QUERY(). The flexibility of OPENJSON() makes it possible to extract any values from JSON data, especially when combining OPENJSON() with JSON_VALUE(). The examples below show how to parse out a scalar value from complex JSON objects (like arrays). Note that using the WITH option gives us a lot more flexibility with how we can format our output result. These JSON functions should help you parse any JSON data you encounter in SQL server (as long as it’s valid and stored as nvarchar). Stay tuned over the next few weeks as we look at other SQL JSON functions that will help us create data, modify data, and compare SQL’s JSON performance to other languages.